Bright and silly stompers! 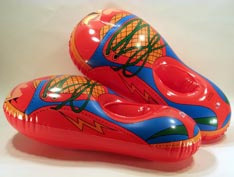 20 inch inflatable foot wear. Perfect for clowns. One size fits most. $1.95 per pair for 72 pair or more. $1.70 per pair for 144 pair or more.